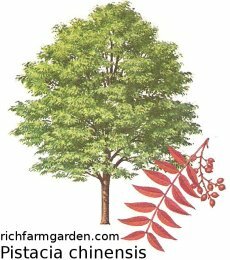 Chinese Pistacio - Pistacia chinense - Small tree with a rounded head and a straight central trunk. Slow growing, it has dark green pinnate leaves which turn yellow in the autumn. Often used as a rootstock onto which nutting pistacio varieties are grafted. Hardy to 20F (-12.2C); height: 30ft.